From dalgos to rupings, the fifth season of The Clone Wars was filled with monster mayhem. Season Five of The Clone Wars is a real creature feature! In the opening story arc, we are introduced to the fertile planet of Onderon, where we find new beasts like the dalgo and ruping, and familiar creatures in new settings, including fambaas and falumpasets. On the pirate haven of Florrum, we travel with a misfit carnival caravan boasting animals from all over the galaxy. 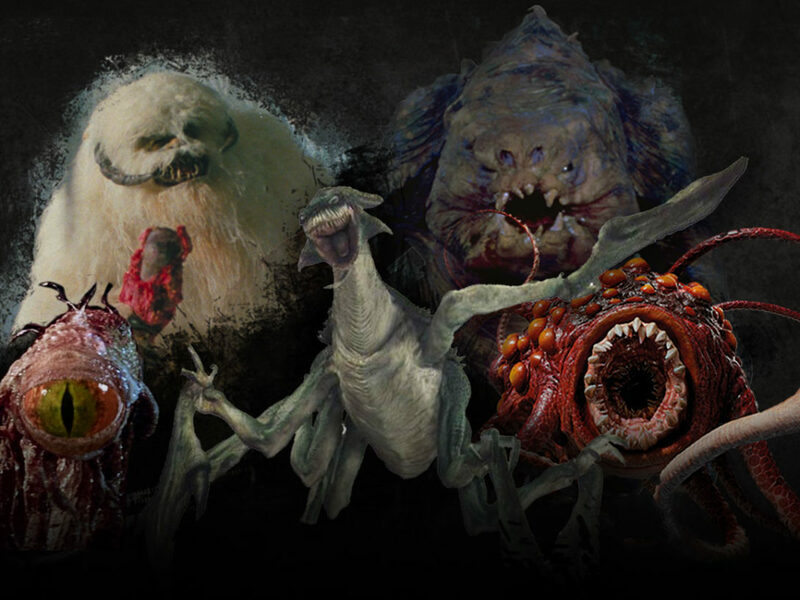 In each subsequent world we visit, we find something new, from the awkward void striders of Abafar, to the adorable tookas of the Coruscant underworld. Following are our top ten highlights. Here’s a creature bred for an adventurous ride! Dalgos are reptilian beasts of burden, native to the planet Onderon, where they are used by locals for transportation and pulling large carts. Fearless dalgos are also used as mounts by the freedom fighters of Onderon, charging into battle against the Separatist droid armies. The dalgo runs a high body temperature and radiates extra heat along a dorsal crest running the length of it’s body. Three nostrils vent the creature’s powerful lungs from the middle of the crest on its head. A wild dalgo is potentially dangerous, with sharp incisor teeth, tusks protruding from their lower jaw, and a long, whip-like tail fitted with a razor-sharp, bony plate. The imposing beasts stand 3m (almost 10 feet) tall at their shoulders and are capable of kicking opponents with powerful hooves. After their first appearance in “A War on Two Fronts” (S502), dalgos make frequent appearances later on, in “Front Runners” (S503), “The Soft War” (S504), “Tipping Points” (S505), and “Bound for Rescue” (S508), as well as Season Six. Peaceful fambaas are the largest land-dwelling herbivores found in the swamps of Naboo. Though they are amphibians, their skin is thick and scally; more like a reptile. Fambaas are born from eggs and grow from a pudgy larval stage, losing their tails as they move to land. Gungangs rear them in herds, training them to pull carts and haul heavy loads for farming and service in their military. Because of their dependability and heartiness as work animals, fambaas have been sold and transported to other worlds like Onderon and Florrum. Fambaas were first seen in The Phantom Menace, where they work in pairs to carry the shield energy drums and shield energy emitters of the Gungan army. Fambaas were originally conceived by Lucasfilm artist Doug Chiang, as two-legged mounts for the Naboo (human) cavalry. 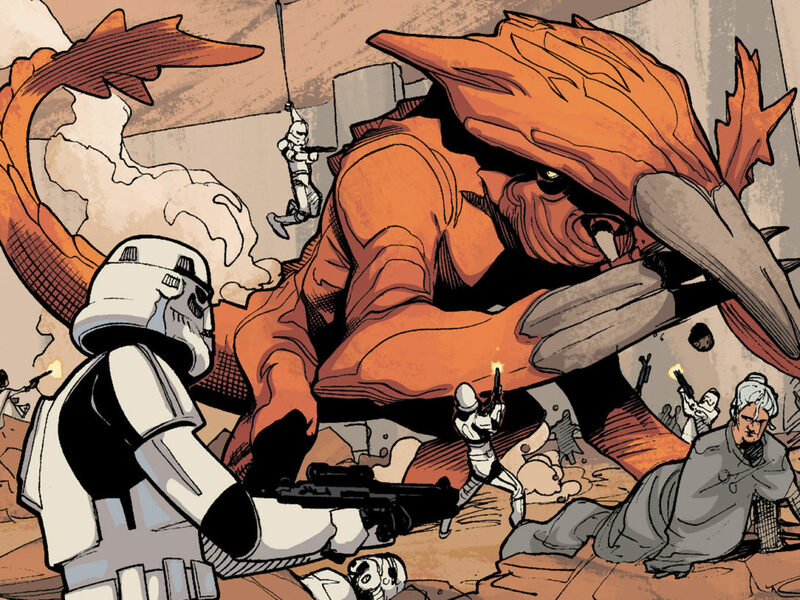 As their design evolved, they became beasts of burden used by the Gungans to carry sonic cannons and personnel. Eventually fambaas acquired a set of forelimbs too, and grew to a gargantuan size. At this point artist Terryl Whitlatch designed the creature’s movements, before handing the process over to CG artists at ILM. 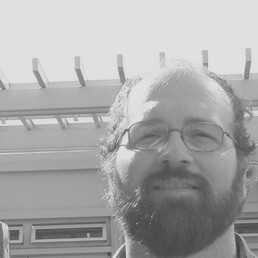 Years later, Lucasfilm Animation artists David Le Merrer and Kilian Plunkett helped adapt the creatures for The Clone Wars. 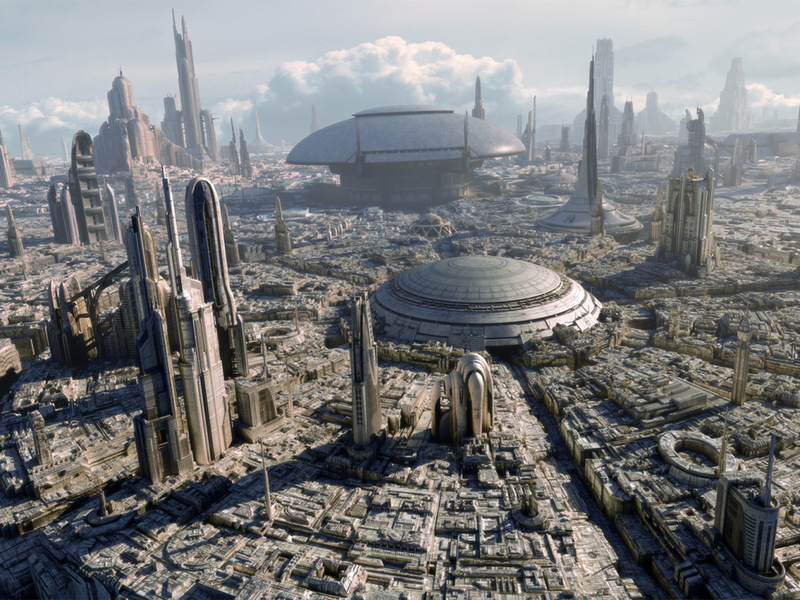 Fambaas were first seen in The Clone Wars on Naboo, in “Shadow Warrior” (S404); and again this season on Onderon, in “A War on Two Fronts” (S502), “Front Runners” (S503), “The Soft War” (S504), and “Tipping Points” (S505); as well as Florrum in “Bound for Rescue” (S508). Rupings are graceful flying reptavians, native to Onderon. Their leathery wings span an impressive length of nearly 15m (49ft) as they glide across forested valleys between rocky highlands, where they nest in flocks. Two pairs of emerald eyes enhance depth perception and extend their range of sight. Bright orange and buff patterns on their body aid in both camouflage and courtship displays. Their wings end in large, flexible hands with fleshy fingers adept at climbing trees and grasping rock cliffs. Onderonians have domesticated the creatures for transportation. They also prove vital to the Onderonian rebels, who fly them bravely into battle. The ruping was designed by artist Tara Reuping, for whom it is also named. Sound designers Matthew Wood and David Acord created the ruping’s unique voice by combining the calls of a lion and vulture, and adding the sound of metal scraping on glass. Rupings appear in “A War on Two Fronts” (S502), “The Soft War” (S504), and “Tipping Points” (S505). Falumpasets are native to Naboo and imported to other words like Onderon as a trusty, though at times stubborn, work animal. They pull carts and aid in farm work but have been helpful in battles on both worlds as well. These mammals have long legs for walking through grasslands but are also excellent swimmers. Falumpasets were designed by Terryl Whitlatch for The Phantom Menace. She describes them as a combination of the body of an extinct rhinoceros without horns, the legs of a Clydesdale, the coloring of an Appaloosa horse, and the intelligence of an elephant. They were adapted for The Clone Wars, with a new coat of paint, by artist Andrew Kirk. Falumpasets appear on Onderon in “A War on Two Fronts” (S502), “Front Runners” (S503), and “The Soft War” (S504). Skalders are thick-skinned herbivores native to the planet Florrum. These herd animals are built a bit like real-world rhinos (or prehistoric animals called Placerias), with an extra pair of small tusks. They were designed by artist Sergio Paez, first appearing in season one, and now again in the traveling carnival featured in “Bound for Rescue” (S508). Narglatch are fierce blue cats native to the icy world of Orto Plutonia. With a mane of quills, powerful limbs, knife-like teeth and claws, narglatch are deadly hunters, fast runners, and a substantial threat to clone troopers. Narglatch are sacred to the Talz, who both ride them and eat them (presumably not at the same time). In Season Five we find a very friendly narglatch owned by a Dug named Preigo. The narglatch is one of several performers in the Dug’s traveling circus on Florrrum, called “Preigo’s Traveling World of Wonder.” During their performance for Hondo Ohnaka and his Weequay pirates, the Wookiee Jedi padawan, Gungi, also happens to wear a Narglatch mask. Narglatches first appeared in the 1999 video game from Lucas Learning, The Gungan Frontier. They were based on an unused design concept by Terryl Whitlatch for Episode I, which was later featured in her book, The Wildlife of Star Wars: A Field Guide. 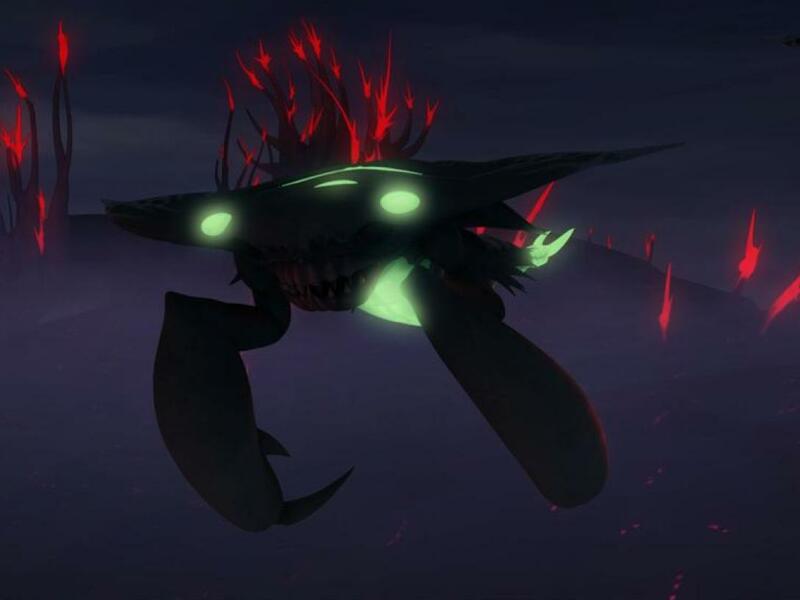 Narglatches are frequent visitors to The Clone Wars, appearing in Season One, Four, and now in “Bound for Rescue” (S508). They also frequently appear in the form of Republic Gunship nose-art too. An alternate jungle version of the narglatch was developed for episodes on Onderon this season, but the design was eventually abandoned. Void striders are herd animals native to the planet Abafar. They exhibit traits of both reptiles and birds, with scaly orange skin, a short tail, long legs ending in clawed feet, and a beaked mouth. The creatures run across the endless mineral flats of Abafar searching for rare water sources. 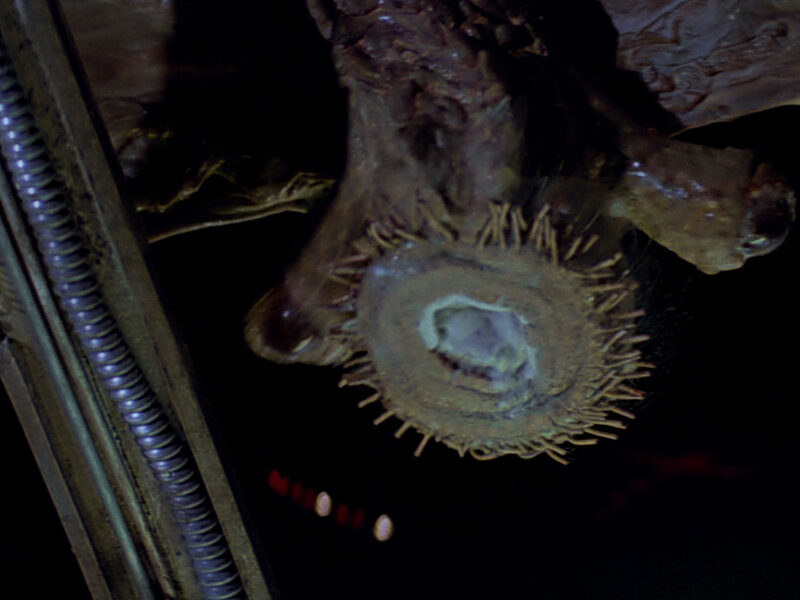 In the episode, “A Sunny Day in the void” (S511), the creatures save Colonel Meebur Gascon and WAC-47 by carrying them from the endless wastes of Abafar to the sunken oasis town of Pons Ora. 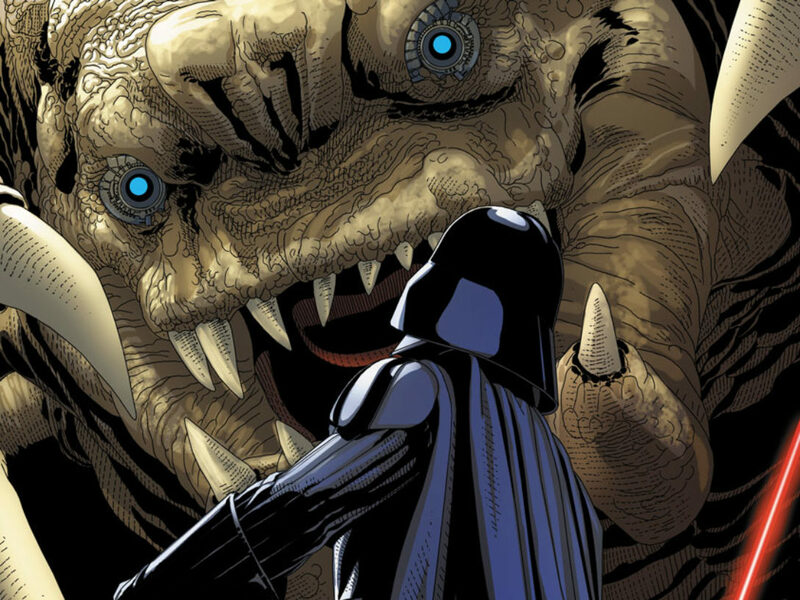 Anoobas are the most dog-like creature yet found in Star Wars, and prove to be a bounty hunter’s best friend. Though native to Tatooine, anoobas have been captured and transported to other worlds too, where they are used for hunting and guard patrols. The infamous bounty hunter, Embo, has adopted a pet anooba named Marrok. In contrast to fierce, wild anoobas who hunt in packs, Embo’s silver anooba is loyal and protective of his master. Marrok and Embo were first seen in Season Four, and now make an appearance in “Eminence” (S514). Anoobas were originally designed by Terryl Whitlatch as a potential creature for Episode I on Tatooine, though were later abandoned for the film. They first public appeared is in Whitlatch’s book, The Wildlife of Star Wars: A Field Guide. 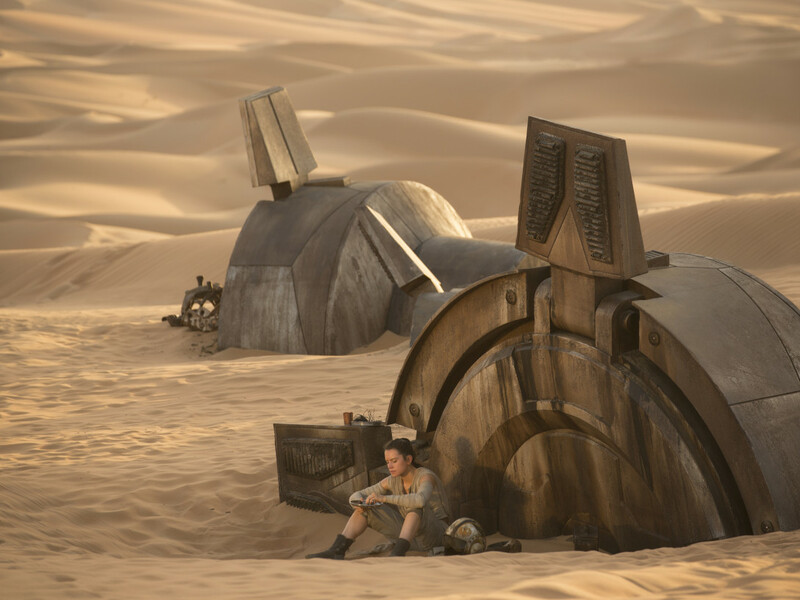 Incidentally, we have already seen an artist’s rendering of an anooba in Star Wars Rebels; on Sabine Wren’s left shoulder armor (not to mention a sketch of Embo in her room aboard the Ghost). Momongs are colorful, intelligent creatures that are native to the Trandoshan moon of Wasskah. They prey upon convores and other small creatures, listening for them in the trees with their large orange ears and then snatching them with one of their three-fingered hands. With their six limbs and prehensile tail, momongs are excellent climbers. Their popularity as pets has helped introduce them to worlds across the galaxy. These primate-like animals were designed by Tara Reuping and first appeared in Seasons Three and Four, and now make a cameo again in “Eminence” (S514). On the adorable side of fearsome beasts (fearsome that is, if you are a tasty nuna or yummy pikobi), is the tooka. These comical felines are found across the galaxy, and particularly common in the underworld of Coruscant, where they stalk little pests in alleys in ventilation systems. Tookas are popular as pets, and transported between countless worlds aboard freighters, where they keep stowaway vermin under control. Tookas were named after Dave Filoni’s deceased cat, Tuuk, and designed by Tara Reuping. They appear in “To Catch A Jedi” (S519), “The Wrong Jedi” (S520), and also in Season Six. The wild loth-cats of Lothal, as seen in Star Wars Rebels, bare a striking resemblance to tookas as well. Whether there is any relation is yet to be determined.